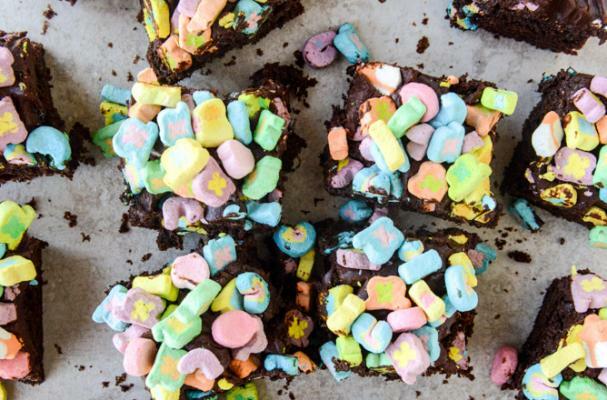 In the unlikely event you have leftover whiskey from your St. Patrick's Day celebration, you should make these chocolate whiskey cake with Lucky Charm marshmallows from How Sweet It Is. A homemade dense chocolate cake is covered in a fudgy ganache and topped with pastel colored marshmallows which add a contrast of color and texture. The ganache is made from a combination of heavy cream and semi-sweet chocolate and spiked with Irish cream. For a richer, more intense frosting, you can use dark or bittersweet chocolate with 70 percent or higher cacao content. This cake is what dessert dreams are made of and I guarantee you will love each bite.